We are almost ready for Back to School next month and all of the children are excited to start their new classes. Gracie will be going into Year 2 and the work is going to get even harder. She is such a good kid and loves to learn but she really worries about getting things right and practicing and so I like to make things fun for her. 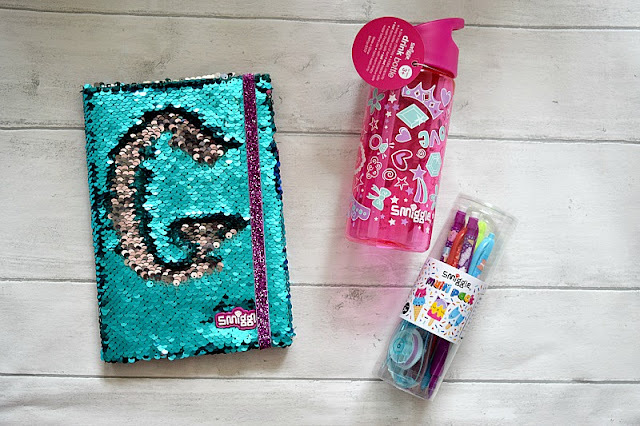 Every year she gets a nice new notebook and stationery for her spellings and story writing (this is one of her new hobbies at the moment and I love to encourage it). Like most kids her age she loves Smiggle. Since we have had one open in our city centre, she is constantly looking in there for new things to spend her pocket money on. You can imagine how happy she was to receive a little Back To School parcel from them recently. With the whole 'back to school' season creeping up on us, I am always looking for ways to make mornings easier and with all three of my babies going to school from September I will need to make things run like a military operation to get us all up and out on time! With having two girls, one of the things that takes up most of my time is doing their hair in the morning. They both have gorgeous long hair but it is quite fine and knots easily. We were recently sent the Wobbly Worm game from Spinmaster to review. The aim of the game is to 'hoop the loopy worm' The game can be played with three different levels of difficulty. The longer you make the worm, the harder it is. 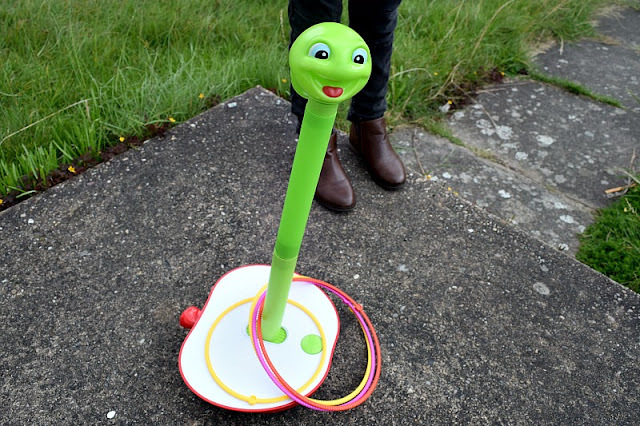 Wobbly Worm is 90cm tall at his longest. The game comes with three different coloured sets of hoops, with three in each set of different sizes. Last weekend we revisited the RSC Theatre in Stratford- upon- Avon, the place we had had our first date earlier in the year. 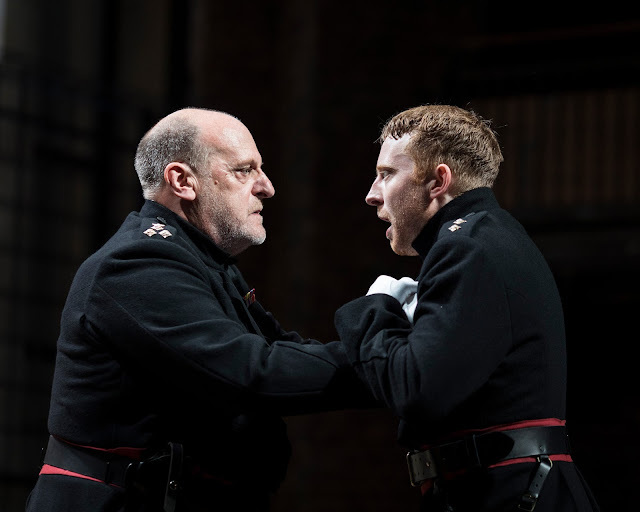 After watching Antony and Cleopatra back in March, which was absolutely brilliant, we this time went to watch Titus Adronicus. Gracie, like most young girls, loves Num Noms and she was so excited to be sent some items from the brand new series 4 collection of Num Noms to try out. 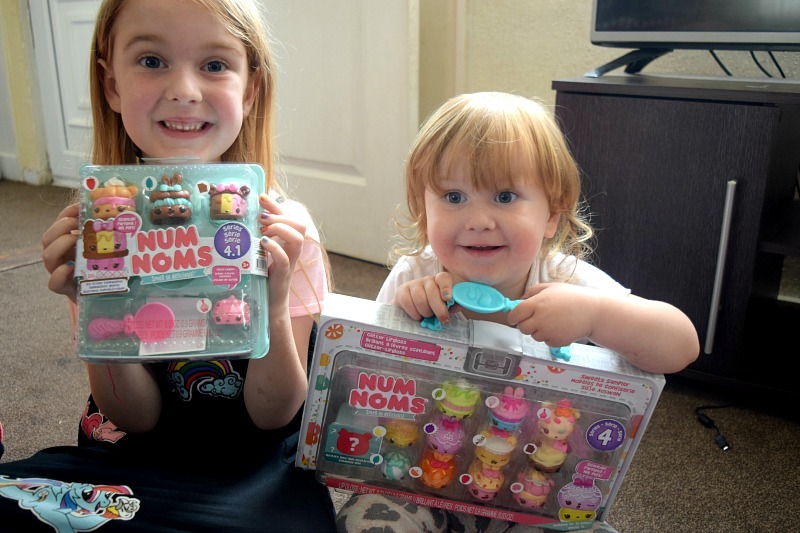 Along with some of the new series 4 sets, we received a copy of the brand new Num Noms magazine. Children can bring some comical and magical moments to a big day, whether they are your own or nieces’, nephews or cousins. It can be worrying planning a wedding with children attending, will they be entertained? How can I make it enjoyable for the parents as well? How will I juggle being a mum and a bride on the same day? With a little planning and preparation, you can ensure a perfect day for all ages. It’s not as hard as you may think to have a child-friendly wedding, they are going to eat too many treats, explore the wilderness behind the ‘off limits to guests’ signs and team up in packs, most of the time they will just do their own thing. 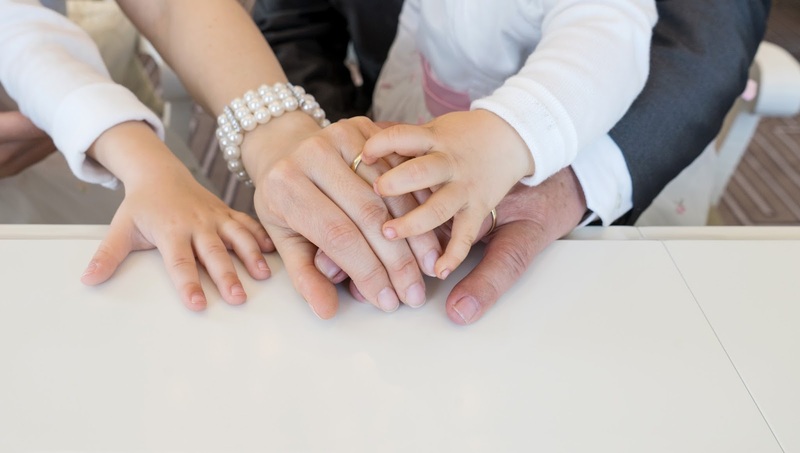 There are a few arrangements you can make beforehand to give them the tools they need to have a great time independently playing together and give the parents at the wedding a chance to let their hair down as well. Here are some top tips to creating the perfect child-friendly wedding. A great way to involve the children in the big day is to give them jobs. This responsibility will make them feel special and the whole day is more likely to go smoothly. Base their jobs on their abilities, it could anything from holding a sign to usher the guests into the church, holding up your dress as you walk down the aisle or passing the microphone around during the speeches. You could give them disposable cameras and tell them they are ‘official photographers’ for the day. You may even find that they capture some special moments that you can cherish forever. Having responsibility keeps children busy and allows the parents a smooth experience without trying to entertain the children while trying to also enjoy the day. If you go for a location that has an outside space, you can set up activities and games to be played on the grass for children- and adults. If your wedding is casual and laid-back, games of rounder’s or races are a fun way to break the ice between the guests and will get everyone having a giggle. A bouncy castle or outside play area is also great to keep the children entertained. It allows the parents to relax, have a drink and let their hair down. After hours and a couple of beers, you may even find the adults having a little go. Venues that hold events like this one in Nottingham usually have a large outside area for your wedding that can cater to any type of outdoor activity. You could set up a pre-mini disco to be held before the adult disco/entertainment starts. It is a chance for all the children to get up and have a boogie and they can participate in games and competitions. 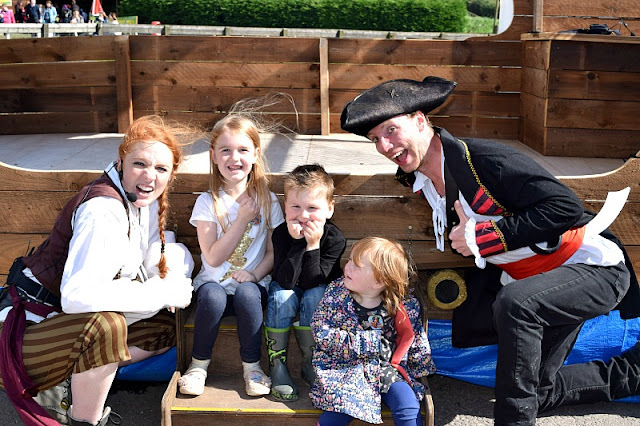 It’s a great way to keep them entertained while the adults can socialise and enjoy themselves before getting up on the dancefloor for the adult disco. It will help the children to make friends that they can play with when the mini disco ends and all that boogieing will tire little ones out for a sleep in the buggy while the parents get up and have a dance later on. The meal and speeches can sometimes be long and boring for young children. A great way to keep them entertained is to place activity packs on the tables for young children, this will keep them entertained. Consider the ages of the children attending and make the packs up according to their age. Younger children will enjoy colouring, puzzles, toys and building blocks. Older children will enjoy word searches, quizzes and a disposable camera for them to capture their own moments. Snack packs are also a great idea to keep their tummies full until the food comes. 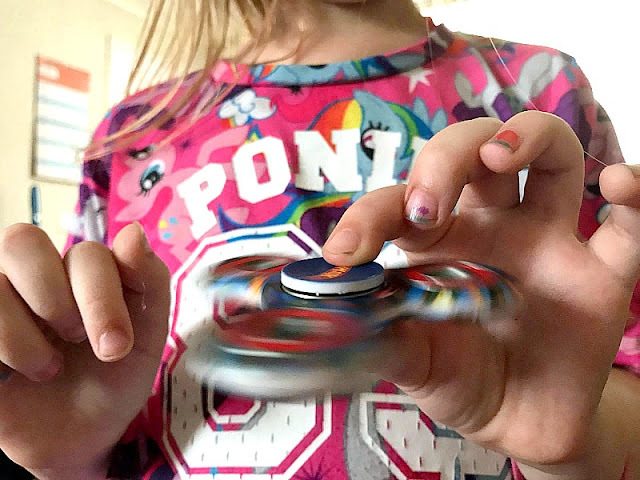 Fidget spinners are the latest big craze amongst children and I have to say my kids were late to join this craze. Mainly because I was a bit worried at the safety of them after seeing a few horror stories on Facebook. This was until Bladez Toyz announced that they were releasing a range of licensed spinners to the market. 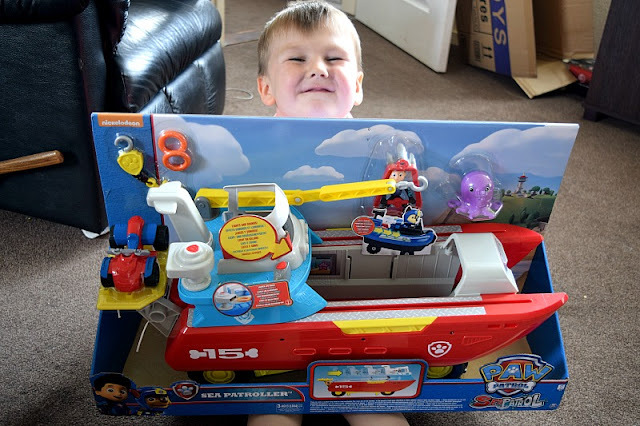 They are fully safety tested and suitable for children 3+. Zach was very pleased to be told I was finally letting him have a fidget spinner of his own and even more excited to see it was a Hot Wheels design. The girls were just as pleased to see the Barbie designs for them. The kids have had them a while now and I must say they are so well made. They are really sturdy and despite all the use they get they are still really happy with them and have learned all sorts of cool tricks already. Elsie's hands are a little too small for them (She is very almost 3 but on the small side) so she has found that if she places hers on a flat surface she can spin it just like her brother and sister. The big two have had no trouble at all though, they are perfectly sized for their little hands. I must say for us parents, they seem like pointless toys but when you sit and watch your children playing nicely together, without arguing and teaching each other the things they have learnt, you realise they are pretty awesome. 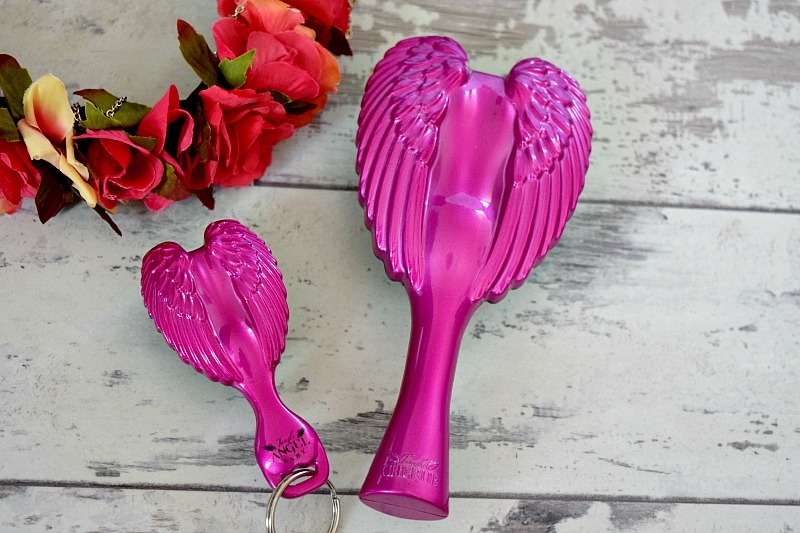 They have kept the kids entertained on car journeys and school runs which has been great and provided me with lots of peace and quiet so they are a winner for me. 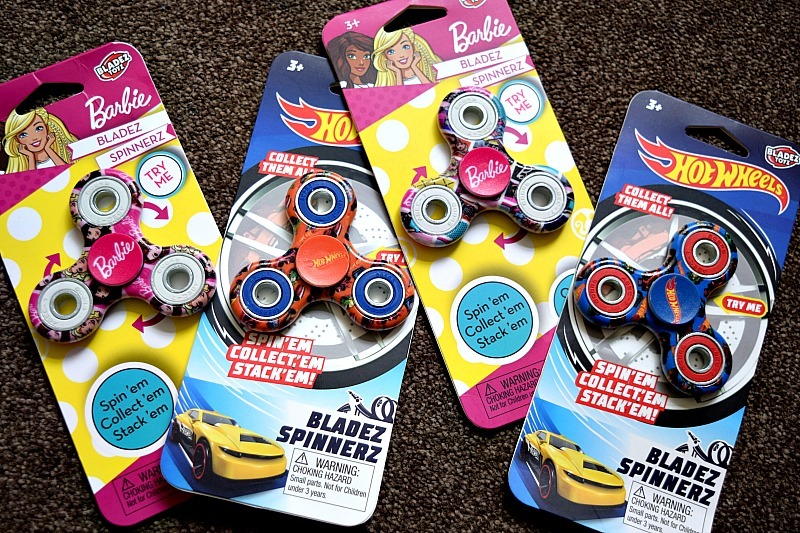 Both the Hot Wheels and Barbie Bladez Spinnerz come in three different colours/designs. They can be collected and stacked on top of one another. 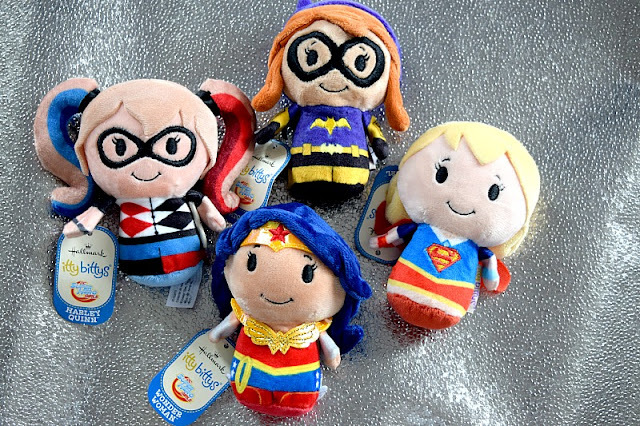 They cost £4.99 each and are available to buy at www.bladeztoyz.co.uk. 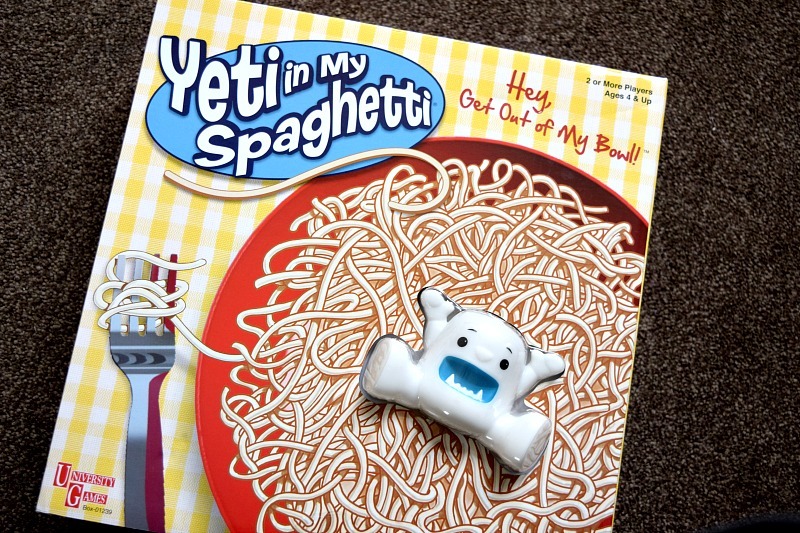 University Games came up with a great game based on this fun story called Yeti in my Spaghetti. 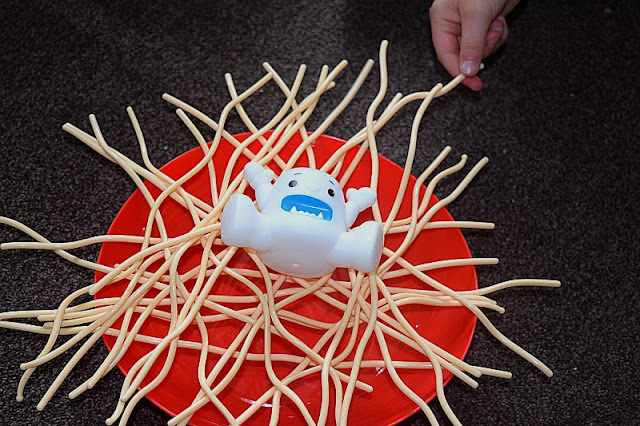 In the game you have a large bowl with strands of spaghetti, you place the yeti on top and then take it in turns to each remove a strand of spaghetti, careful not to let the yeti fall into the bowl. If he falls into the bowl after you have pulled out your piece of spaghetti then you lose! We have played the game a few times now with a few of their other friends. All of the children have absolutely loved it. I played with them the first few times but we soon found that it is so easy for them to set up and play themselves that they don't particularly need adult supervision, unless someone decides to cheat and they start to argue! The great thing is you can have as many players as you like and no one gets left out which is so important for children's games especially when entertaining other people's children too! The game is fun and silly and I would definitely recommend it. I used it with a range of children between 2 and 7 and they all enjoyed it and could understand the rules easily. Yeti in my Spaghetti is available to buy from Amazon and most good toy retailers.